One of the necessities of any wheel-thrown ceramic is the circle, given its sections by the rotation of the clay about the vertical axis of the wheel, which varies only in size. The axis of this circle is the invisible constant factor to which all a pot's inflections relate in one way or another; it may be high or low; the pot may depart wide from it , or hug it closely; the shape may swing wide here, close in there; the possibilities are endless, But whereas the axis is invisible, the circular section is extremely visible; it is, as it were, the concrete factor of shape with which the wheel-potter always begins. And the shapes he then evolves, whose inner and outer surfaces are each the 'function of revolution' of a contour, all have a morphological continuity with the circle. The Geodes project actually came out of being a young woman living in Los Angeles with no prospect yet for a husband or kids. I wondered, ‘When is this stuff supposed to happen?’ I wanted to find a way to quell my panic and anxiety about the future, so I decided to find a way to stop time. I started with the most basic thing — the breath. I would blow up these balloons and watch them shrink over time. Blowing up balloons and expelling this breath or fear and watching them slowly change over many months kind of gave me a sense of peace. Like, ok, I’m changing, time moves slowly, everything’s going to be ok. After I spent some time making these temporary sculptures, though, I still wanted to see if I could truly capture that breath — if I could save time, find a way to seal it in, make a moment last, do the impossible, really. GRIDSCAPE is a month-long exhibition featuring new work by artist’s Ben Medansky and Bradley Duncan. Objects explore two dichotomies crucial to Southern California’s manipulated terrain: grids created by architectural structures and flora-filled desert landscapes. Concepts examined include the monoclinic mineral azurite and the cuboid crystal pyrite, radial symmetric ceramic vessels adjacent to peg works, and vertically erected cacti. 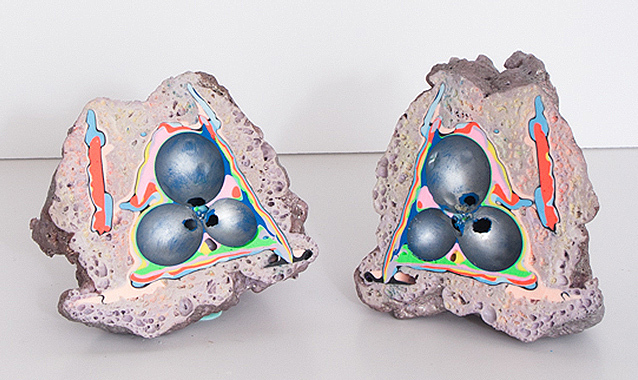 Accompanying the exhibition are mineral influenced works by artist Lauren Spencer King. "Another Cats Show," more than 300 works by 300 artists, mostly from L.A., on view at the Boyle Heights contemporary art space 356 Mission, on the edge of downtown L.A. The exhibition includes drawings, paintings, videos, sculptures and even sound pieces by the likes of John Baldessari, William Leavitt, Meg Cranston, Benjamin Weissman and painter Laura Owens, who founded 356 Mission. With works filling the wallspace of the 12,000-square-foot former garment manufacturing warehouse, the show is whimsical, frenetic and more than a little cheeky. The Hammer's biennial exhibition Made in L.A. 2014 features works by 35 Los Angeles artists with an emphasis on emerging and under recognized artists. OK GREAT THANKS THIS IS SO RIDICULOUS at. ACME. We hope you'll join us on the afternoon of Saturday, June 28th for a very special event: a summit on artist and ceramicist Doyle Lane, whose works are currently on display in the Landing, including two clay paintings on loan from the California African American Museum. The summit will also serve as a book launch and signing for the Doyle Lane catalogue that will accompany the exhibition. The catalogue--the first-ever book on Lane's work--features a forward by Lane collector and enthusiast Ricky Swallow, a contemporary artist whose works are included in this year's Whitney Biennial in New York and the Hammer's Made in LA. end appearance and bears evidence of the designer-user collaboration." The 'Build Your Own' workshop series will awaken your inner Renaissance man (or woman.) Each week the participant will take home a fully functioning piece made with their own two talented hands. The mottled drips on the bookends inevitably bring to mind Pollock’s mature work, but he did not master the art of splattering paint until the late 1940s. To call them forerunners of the abstract canvases would be too brazen an act of scholarship, Mr. Clark said. Fontana’s concept of Spazialismo, as formulated in the texts that he published on his return to Italy, was based on the principle that in our age matter should be transformed into energy in order to invade space in a dynamic form. He applied these theories to a feverish, violent, subversive and radical production in which he synthesized the various elements of his art. He devised the generic title Concetto spaziale (‘spatial concept’) for these works and used it for almost all his later paintings. These can be divided into broad categories: the Buchi (‘holes’), beginning in 1949, and the Tagli (‘slashes’), which he instituted in the mid-1950s. In both types of painting Fontana assaulted the heretofore sacrosanct surface of the canvas, either by making holes in it or by slashing it with sharp linear cuts.